Stefan Garlicki (Investec) won round one of the South African National DH series at Helderberg Farm on a testing track on Sunday 28 February. Garlicki made it two-from-two at the venue (he won Round One of the 2016 Western Province Downhill series there two weeks ago) when he beat Jonathan Philogene and Johann Potgieter with a time of 02:53.277. “It was wild!” commented the 2015 SA National Downhill Champion after the event. “I don’t think I’ve ridden a track anywhere in the world that was as loose as that,” he said, explaining how the weather had been hot and dry in the lead up to the race, making for extremely dusty conditions on the day. “It was tough and really really happy to put it all together because it wasn’t easy to put it together on that track,” said Garlicki. The women’s event was won by Rika Olivier who dominated the field with a winning time of 03:50.924, fast enough for 39th overall! Organisers were very happy with how the success of the event, with some 85 riders from across the country making the trip. “A big thank you to our partners Holdfast, Squirt, BMT Bike Shop, Red Bull and now Dazzne South Africa,” said organiser Riaan du Preez. 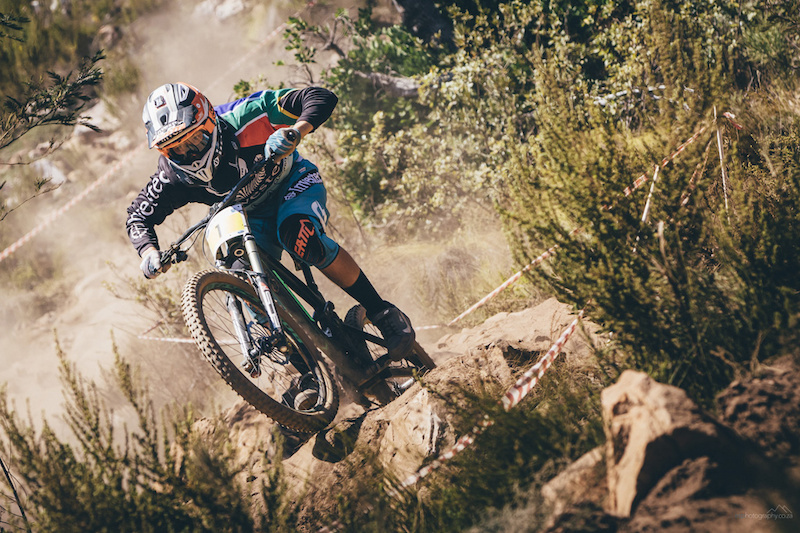 We had riders from Namibia, Gauteng, Limpopo, KZN, the Free State and even Plett making this more than just a national but a true international dusty downhill round one,” he concluded.